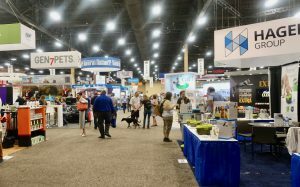 Eleven hundred exhibitors came to SuperZoo 2018 held at Mandalay Bay Convention Center. SuperZoo is North America’s largest event featuring products for pet retailers. It is also a show filled with pet lovers, live pets and cute plays on words (Clam Chowda, Pork Chomps and Pawdicure Polish). The live pets model for products or compete in multiple grooming contests which are also part of the show. 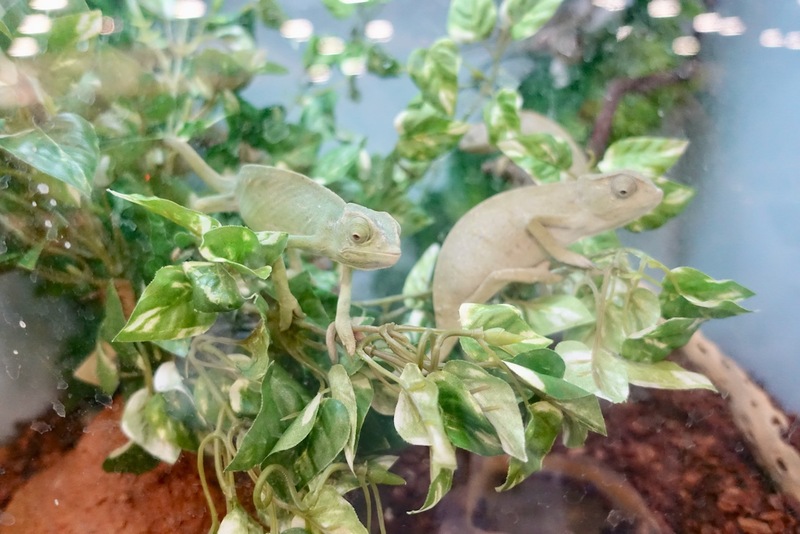 Among the attendees are owners/managers/buyers of pet stores, veterinary offices, grooming parlors, kennels and other retail establishments featuring pet products. They come to buy products shown by the 1100 exhibitors. Education is part of the attraction at SuperZoo with workshops having titles, such as “Are You Ready to Start Your Business in the Pet Service Industry?”, “How to Increase Your Brick and Mortar Business in a Digital World” and “Safety First in the Kennel and Grooming Salon”. 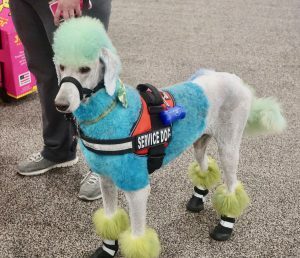 Yes, live animals are also welcomed to SuperZoo, in this case a colorful service dog. As a pet parent myself, I have always enjoyed the World Pet Association’s SuperZoo. I typically see products that are new to me, yet I am also intimidated in that I have not yet introduced my pets to fancier food products for my pets, for example, products made of yak cheese, wild caught salmon or gluten-free, GMO-free, glycerin-free and grain-free gravy. Once again, I toured this show with a video camera in tow. I read on the World Pet Association web site that among the food trends at this year’s show were single ingredient treats (beef, pork, chicken & turkey), and ingredients such as carrots, cannibidiol, honey and pumpkin. I found a few of these trends on my tour, but I also saw clever new packaging, designer dog dishes and dog apparel, a number of psychological tools in terms of special collars for dogs, memory books for deceased pets and even cakes devoted pet owners can bake for their four-legged family members. Although SuperZoo highlights products for dogs and cats, other animals are celebrated as well, including these Senegal chameleons. One of the great side benefits of this show is that representatives from rescue organizations attend this show and, particularly on the last day of the show, will receive numerous free donations that will help sustain their organizations. On Wednesday, I ran into a gentleman with a large dog stroller filled with goods. He said everything, including the stroller, had been donated to his cat rescue ranch in California. SuperZoo this year featured more than 800 new products, and it’s impossible to see everything. Nonetheless, for a taste of SuperZoo, I offer the video. Really wish my and my fur son could have been there! He would have loved it. Some of those products look truly exceptional, might actually look for them online. Thank you for documenting the event as well, really helps those of us who didn’t get to be there.